The numbers of children and their families that are tormented by negative, oppositional, defiant meltdowns is truly staggering. This behavior is so prevalent that it has now even been given a formal psychiatric diagnostic label – Oppositional Defiant Disorder (ODD). Healthcare practitioners, counsellors, parents and teachers are – unfortunately – using this term to describe difficult children. This makes me so angry and so sad because being oppositional and being defiant is NOT a disorder. It is NOT a psychiatric problem. It is NOT a sign of a child having a personality or character defect; it is NOT a child that is mean-spirited! What Does Such Behavior Mean? Parents all tell me the same thing – ‘We don’t know how to parent our child in a way that will help him overcome these issues.’ They tell me that talking nicely to him doesn’t work, lecturing makes things worse, giving him consequences is useless because he doesn’t seem to care. So, why does this seem to be such a difficult problem to resolve? Why do so many parents and teachers find it so difficult to help these defiant, angry children? The reality is that defiant kids don’t wake up in the morning and decide: Today I am going to be difficult and defiant and say “no’ to everything and disagree with everybody… and kick and scream… If they had a choice they would most definitely not want to behave that way. In fact, many children tell their parents after an incident that they don’t know why they behaved that way and that they don’t like the way it makes them feel. It does not make any sense whatsoever to treat these kids as though they are capable of choosing to behave differently. At the moment of the incident, they are NOT capable of making a better choice. Why? Because defiance is a stress-related condition. It is caused and made worse by stress and brain inflammation that go hand-in-hand. Inflamed brains cannot behave positively, feel good or hear what you are saying. It makes sense then that the No.1 parenting goal is to learn how to reduce the child’s stress by responding to the child in a stress-less way. Understandably Moms and Dads (and teachers) of defiant children reach a point where they become stressed. This triggers stress in the child. The child responds with defiance. This is the well-known stress-related ‘Fight’ response. It is driven by stress chemistry in the brain. In other words, your child’s defiance is chemically driven. It is caused by high stress which inflames the brain. Now your beloved son or daughter’s defiant behavior is beyond his or her control. At this moment, there is little you can do to deal with the defiance until you child becomes calm. If defiance is a chemical reaction, this begs the question: If being defiant, angry and oppositional is beyond their control, does it make sense to impose all kinds of punishments and consequences on these kids? When we do that we are treating defiant, oppositional children as though they don’t want to behave well, when in most cases they desperately do, but they simply can’t? In my video you will learn that when Moms and Dads are stressed, you are more likely to have inflammatory conversations with your children, using words and body language and tone of voice that is punishing, discouraging, angry, negating and consequence driven. Stressed parents are also less likely to listen, really listen to what your children are telling you. Communicating with your children in this way is what I call Inflammatory Parenting. The result is that your children’s brain will become stressed and inflamed, which triggers the angry, not listening, defiance. 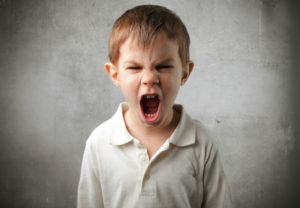 This will upset you even more, so you raise your tone of voice more, present even more negative body language and threaten greater consequences –and your child’s defiant symptoms get even worse. Are you having inflammatory conversations with your child? Here are just some examples of inflammatory language. How do you rate on this? Don’t rate yourself on the exact words but more on the type of message. “No! No! No!” You never ever do that! Think about how often you use one or some of this kind of inflammatory language? Neuroscientific research teaches us that for every one of these statements you should make 5 positive statements! This means that 80% of your conversations with your child are positive and healing. What is your ratio? If you think, ‘Oops!’ I am having too many inflammatory conversations,’ become aware of this insight and take it really seriously. (It probably never occurred to you that you could literally be causing your child’s brain to become inflamed – which then aggravates the very symptoms you are trying to heal). The way parents and teachers speak to the child can either worsen their defiant symptoms or play an important role in healing them. Make the decision to learn exactly how a Healing Parent communicates with a defiant child. In my next blog, ‘How to Have Healing Conversations with Your Defiant Child.’ I will teach you how to replace inflammatory conversations with HEALING CONVERSATIONS with 3 easy-to-use parenting skills that are consequence-free, lecturing-free, and stress-free. Before you go to this next blog, please be sure to watch the video, Is Your Behavior Triggering Your Child’s Defiance? which explains what happens to your parenting style when you are stressed. And think about the critically important question I ask on the video. Does it apply to you? Please share your thoughts about this with us. We can all learn so much from your comments.